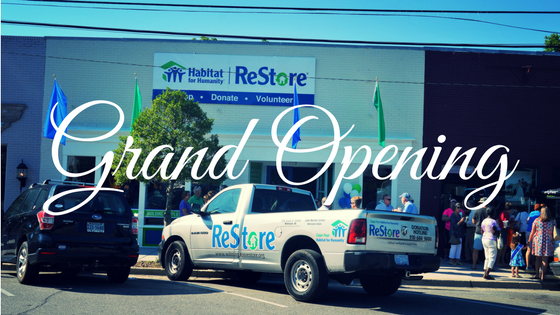 On Saturday, June 3, Cape Fear Habitat for Humanity held its Grand Opening for the newest Restore in Burgaw, NC. The building now occupied by the ReStore is conveniently located in the central business district of downtown Burgaw at 115 W. Fremont Street. The formerly unoccupied building has been transformed, with the help of ReStore staff and many dedicated volunteers, into an updated and welcoming space. 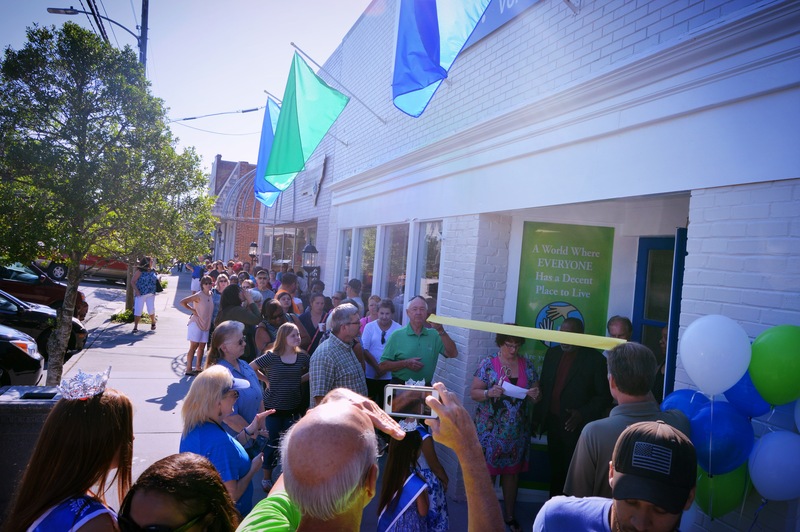 On the day of the Grand Opening, over 100 people lined the sidewalk and anxiously waited for the ceremonial ribbon to be cut (by Cape Fear Habitat Executive Director, Steve Spain) and the doors to the new ReStore to open. Their wait was made even sweeter by the free delicious donuts that were donated and served up by MeMa’s Chick ‘n’ & Ribs, a local business in Burgaw. In addition, those waiting in line heard from Mayor Mulligan and Pete Cowan who spoke at the ceremony, as well as Dr. Hicks from Hills Baptist Church who gave a moving and beautiful blessing. 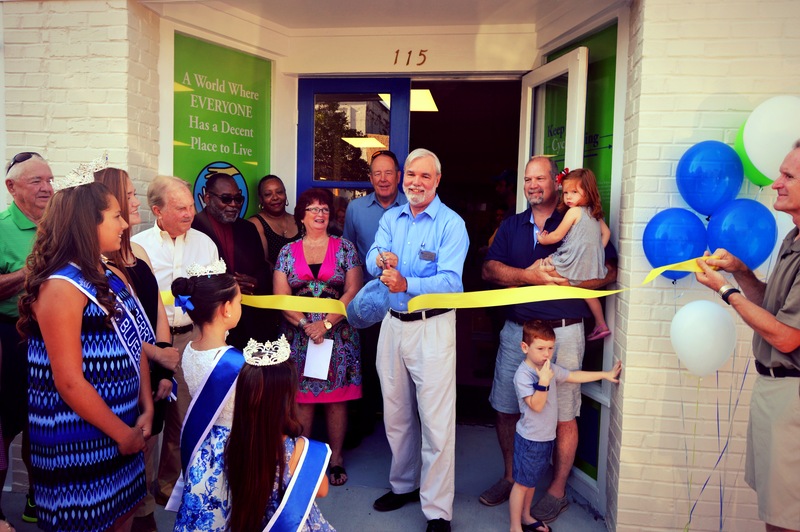 Steve Spain, Cape Fear Habitat Executive Director cuts the ceremonial ribbon at the Grand Opening. The long line formed as people anxiously awaited for the doors of the new ReStore to open. 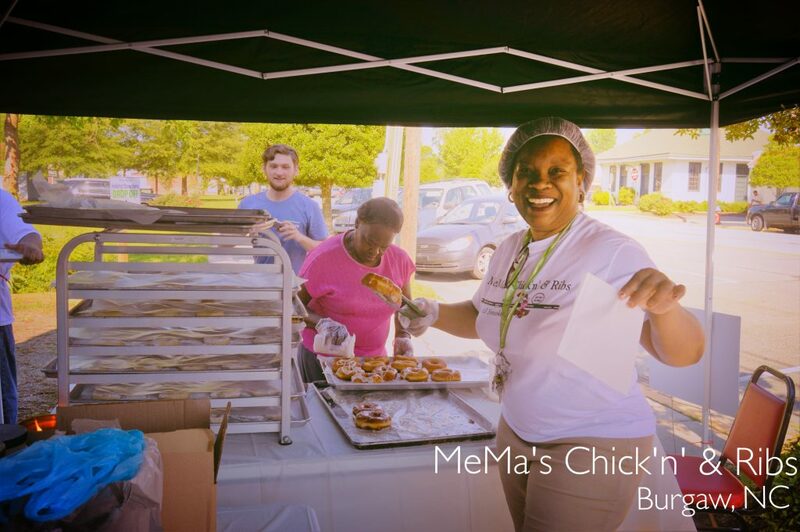 MeMa's Chick'n' & Ribs kept the crowd calm with their delicious donuts! The Grand Opening was a major success with over 180 transactions. Every ReStore purchase supports the mission of Cape Fear Habitat by providing household and building supply items at below market cost while protecting the environment. The ReStores resell items in good condition that would otherwise end up in the landfill and all for prices 50 to 80 percent below retail. ReStore relies on donations and we’re very thankful to all of the businesses who donated their time, resources, and support to the opening of our Burgaw location: Advance Auto Parts, Tractor Supply Co., Harris Teeter, Food Lion, NAPA Auto Parts and K & B Auto Parts, NAPA KNOW HOW, The Coca-Cola Company, and MeMa’s Chick’n & Ribs. A very special thank you goes to all of our volunteers who did an incredible job on the building remodel, and who also worked hard to stock the store with donations made by our generous supporters. Many thanks to the Burgaw Area Chamber of Commerce for providing the big scissors to cut the ribbon. Many shoppers check out the ReStore on a regular basis because new items are always coming in and the deals are so good that nothing stays in the store too long. Shoppers will find furniture, household goods, building supplies, appliances, electronics, housewares and so much more. It is a fantastic place to start any DIY project, find craft ideas, or score great deals for your home improvement projects! The ReStore in Burgaw is open Tuesday through Saturday from 9am to 5pm. Make sure you follow the Cape Fear Habitat ReStore on Facebook to stay up to date with sales, promotions, new inventory, and general store updates. Items are donated to the ReStore in a variety of ways. Some businesses regularly donate unused or re-usable materials throughout the year. Locally, builders, renovaters, and demolishers also donate unused or re-usable materials on a regular basis. One of the largest sources of donations are from individuals who simply bring in, drop off, or have items picked up that are taking up space in their garage, basement, attic, or sheds. All donations to the ReStore are tax deductible. You can also feel good about diverting waste from the landfills and giving your unwanted items new life to be enjoyed by someone else. If you can’t transport your donated items, we’ll pick it up for free! You can schedule a pick-up online or call (910)686-9800. Please visit the website to see what items are accepted and schedule your pick-up today. 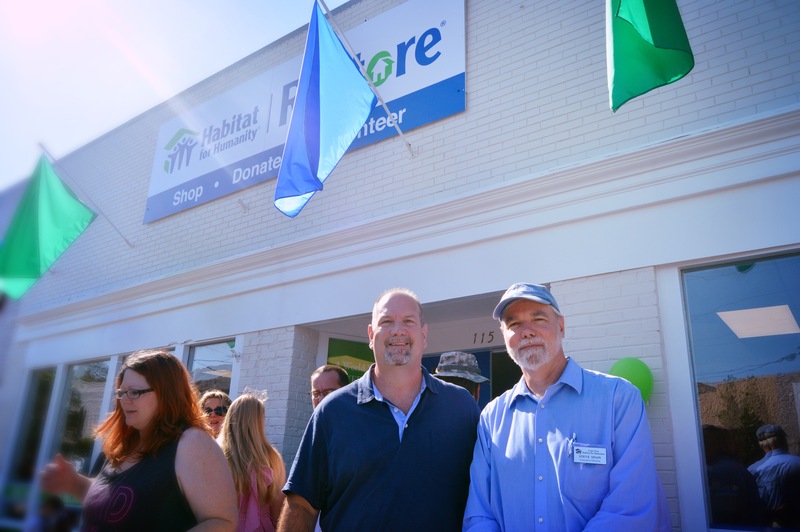 Proceeds from the ReStore helps Cape Fear Habitat cover the administrative and fundraising expenses and provides funding for building homes. This means volunteers are vital to ensure the ReStores remain a sustainable source of funding, allowing us to continue to serve more families in our community. Volunteering is fun and easy. Volunteers work every day in the ReStore doing things like process donations, moving inventory, pricing items, assisting customers, and running registers. Other professionals with specific skill sets that relate to all things retail, DIY, etc. also lend their expertise to the ReStore on a pro bono basis. If you are interested in volunteering contact Zachary Lee, ReStore Volunteer Coordinator at zachary@capefearhabitat.org or at (910)686-9800 x 107.